Their mother Ruth and uncle Raymond grew up in the town of Dachau, and because of their Jewish antecedents their family, the Neumeyers, was persecuted by the Nazis, although the Neumeyers were actually practising Christians and didn’t consider themselves Jewish. Stephen and Tim’s grandparents, Hans and Vera, had a dreadful reverse of fortunes after 1933. Hans, a blind music teacher and composer, lost his job and Vera had to do forced labour in market gardening. On the night of the nationwide pogroms known as Kristallnacht – the ‘night of broken glass’ – they were ordered by the authorities to leave their house by dawn. They stayed in various friends’ attics in Munich for the next six months. Vera wrote to some friends in England who kindly agreed to receive Ruth and Raymond and look after them. Tim, of Paddock Lane, Lewes, explained: “So my mother and uncle left Munich on a Kindertransport train the following May. Their parents saw them off at Munich’s main railway station and said they’d follow soon. But the children never saw their parents again. “Hans was deported in 1942 to Theresienstadt, where he died in 1944, while Vera was taken in 1942 to Piaski in German-occupied Poland, where she was probably murdered in Madjanek concentration camp. Friday, November 9, marks the 80th anniversary of Kristallnacht, and Tim and Stephen have been invited by the town of Dachau to attend a special ceremony and to give talks to audiences at the town hall and at a school. There will be performances of some of Hans Neumeyer’s music compositions. 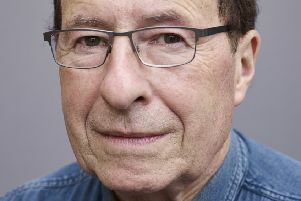 ‘My parents attended a similar event for the 50th anniversary in 1988,” said Tim, “when many of my mother’s friends from Dachau were still alive and residing in the town. “I can’t pretend it won’t be pretty strange to go back there myself and to speak so publicly about what happened in Dachau 80 years ago, but my mother and uncle actually had a lot of affection for the town up until the Nazi era – it was an artists’ colony, and it’s still got an attractive old town and a castle. After Ruth died in London in 2012, Tim discovered that she had kept virtually everything relating to that period. “There are more than 50 letters from her parents during 1939 to 1940, a photo album stuffed with wonderfully evocative pictures of family life in Dachau, diaries from every year except 1938, school exercise books, Red Cross messages, a few pieces of music composed by Hans Neumeyer and even the ferry ticket that took them on the Kindertransport from Hook of Holland to Harwich in May 1939. “Very excitingly the Imperial War Museum in London wants to take the entire archive, as they say it’s unusually comprehensive, and several items from it will go on permanent display in the new Second World War and Holocaust Galleries planned to open in 2021.